With its 4K resolution, Ultra HD is craving for higher bandwidth connections, not only to feed individual monitors and video walls, but also for connecting cameras to switcher equipment in live events settings. With latest 6Gb chip technology, the SDI and HDMI video standards allow for 4K signals to be transported from one place to the other, however traditional copper cabling technology severely limits maximum cable length. For instance, even with highest quality coaxial cable 6Gb SDI can‘t be carried over longer distances than 60 to 70 meters without severe signal losses. Video equipment for live events recording is becoming lower cost at a steady rate, and 4K cameras and switchers already have hit the market at amazingly low price levels. So here is the challenge: there is a growing demand for high quality cable connectivity that can make it all work together, with minimum delays and absolutely no signal loss – but any product that fits the bill has to be offered at comparable low price level. It‘s time for FieldCast. 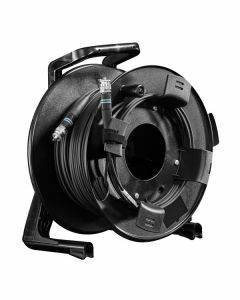 The fibre cable of the FieldCast product line can be either 2Core or 4Core on the one hand and single mode or multimode on the other hand. So one can choose for 2Core single mode fibre cabling, 2Core multimode, 4Core single mode, or 4Core multimode. The 2Core products have two cores of fibre and are indicated by 2 rings on the connectors. The 4Core products have four cores of fibre and are indicated by 4 rings on the connector. The single mode products (SM) have 9/125 fibre core with yellow rings on the connector. The multimode products (MM) have 50/125 OM3 fibre core with blue rings on the connector. The FieldCast product line consists of different types of products to build an infrastructure with fibre connectivity. Below are the main product categories. Main Cables - long fibre cables to bridge long distances. Coupler Cables - to chain FieldCast Main Cables. Chassis Connectors - to connect FieldCast Main Cable to equipment with standard LC fibre connectivity. Adapter Cables - to connect FieldCast Main Cable to equipment with standard LC fibre connectivity over cable. Accessories - things you might need in the field. For the Main Cables there is an Ultra Light version and a Heavy Duty version. The Ultra Light cable is a high quality robust 4.8mm cable. The Heavy Duty cable is a high quality extremely robust 6.5mm tactical cable, initially meant for military purposes and very much suitable for outdoor live events cabling purposes.